The Letter to Titus is often branded as incoherent, its salutation inchoate. Such premature conclusions are directly related to the authenticity debate that has marred analyses of the so-called Pastoral Epistles. From the corridors of academia echoes the cry to study the letters individually and independently of the authorship issue. This book does exactly that. It lays bare intricate and novel persuasive strategies, strategies that belie the charge of incoherency. In fact there is not one, but three ways to describe the structure of this masterfully composed letter. In Persuading the Cretans, Aldred Genade does this utilizing a technique known as text-generated persuasion analysis. Careful thought has gone into the composition of the letter to communicate timeless truths relevant for generations of Christians. This is first-century outcomes-based communication at its best and communicators, preachers, and scholars stand to benefit from the lessons in communication the author of Titus can teach us. 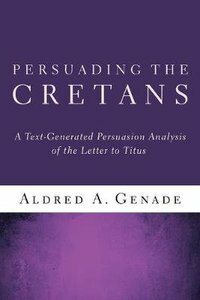 ""Aldred Genade's book, Persuading the Cretans, lays bare intricate and novel persuasive strategies in the Letter to Titus, utilizing a method he coins as text-generated persuasion analysis. These strategies belie the charge that the Letter is incoherent and that its salutation is inchoate. Genade suggests a multilayered coherent structure for the Letter to Titus, and in this unique way, persuasively addresses the coherency debate."" --Fika J van Rensburg Faculty of Theology North-West University ""This book represents a welcome addition to the rhetorical analysis of the Pauline corpus ... All future rhetorical analyses of the Letter to Titus will have to take this study seriously."" --D. Francois Tolmie Dean of Theology University of the Free State, South Africa ""Genade has produced a study of Titus that is unique in two ways. First, the book is wholly focused upon the rhetorical approach of Paul in his epistle to Titus. Second, Genade's method of rhetorical (persuasion) analysis is one that grows out of the text itself, not one superimposed from classical or contemporary approaches, and highlights argumentative strategies and rhetorical troops. I commend the diligent efforts invested in this work. From now on those writing on Titus will need to dialogue with Genade's conclusions."" --Thomas H. Olbricht Distinguished Professor Emeritus of Religion Pepperdine University Aldred Genade is New Testament lecturer and Director of the School of Continuing Theological Studies, Faculty of Theology, North-West University, Potchefstroom, South Africa. About "Persuading the Cretans: A Text-Generated Persuasion Analysis of the Letter to Titus"